This ‘Air sans paroles’ (as it was known in the Poulenc circle at the time) was one of a huge series of such pieces commissioned, ostensibly for teaching purposes, by Amédée Hettich, singing professor of the Conservatoire, and published by Leduc. 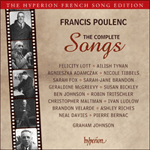 In a list of the fifty-nine vocalises for high voice Poulenc takes his place besides such composers as Fauré, Messiaen, Milhaud, Ravel (the most famous of them all—the Pièce en forme de habanera) and even the young Aaron Copland. He writes a dramatic and angular piece of high seriousness in B minor which makes considerable technical demands. If it is true that in 1927 he has not yet found his ‘voice’, the singer has to find hers from the very first bar. The music in his occasional marche funèbre style—albeit in triple time—reminds us of the earlier Chanson à boire. 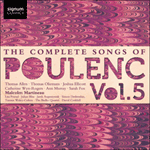 It has a severity and a bleakness that is not at all characteristic of Poulenc’s later vocal works, although the mood of this music makes a rare reappearance in Le mendiant from Chansons villageoises. This is a far cry from the transparent femininity of the Vilmorin settings; if those later delights might be characterized as Poulenc’s Così fan tutte songs, this Vocalise (performed several times by Jane Bathori and the composer) brings to mind Gluck’s uncompromising Iphigénie. Poulenc wrote his Vocalise in 1927 for the ninth volume of Leduc’s series Répertoire moderne de vocalises-études, published in 1929. It follows the traditional pattern of such pieces, testing breath control, legato, intonation, dynamic contrasts and placing of high notes. The harmonic style, recognizably Poulenc’s own, veers between comforting lyricism and a sourer brand of melancholy.